Anyway, BCM is pretty easy to use. One of the nicest features it has is the auto-linking button. Basically you can select an email in your inbox and click the auto-link button and choose an account or contact to link the email to. The email then shows up in the account’s or contact’s history. Any email that comes in from the same address, or goes out to the same address, will be linked to the account or contact automatically. While CRM has similar functionality, it relies on the ugly and problematic GUID in the subject line. This is because it has to catch the email as it enters Exchange and decide what to do with it there. I understand that part, but it would be nice to have the end-user experience in CRM Sales For Outlook as simple and clean as the BCM experience. This brings up another problem with CRM’s Outlook client: synchronization. This has been a buggy process in need of much improvement. Even though MS released some refinements to the synching process a few months ago, its major problem (aside from whether it actually works) is that it is not at all intuitive for the average salesperson. There seem to be too many steps to go through to go offline and synch up, leaving questions in the user’s mind about whether he got all the right data or not. Not to mention the fact that activities scheduled in the web client won’t show up in Outlook unless the user goes offline. What about when they are going to be in the office for a week or two? Kind of a pain. I’m hoping for some major improvements in this product by next year’s release. So far I have avoided deploying it on a large scale for our clients, mainly because I don’t want to have to support it in the field. Judging from our experience with it in our own office with a bunch of highly certified tech guys, it would be a major source of complaints and hassles for the average, non-tech-savvy salesperson. I am looking for information! Is this BCM ready for primetime...I am growing a sales organization and need a good contact manager with extended CRM capabilities. We are a MS partner and would like to stay with MS...however I need a product that will neet the sales / marketing needs! I’ve noticed that there have been a number of messages with questions about using salesforce.com offline or inside of Outlook, so I thought I would drop in my (somewhat bias) 2 cents. I work for a company called InvisibleCRM, and we have created several new applications for salesforce.com that will make your life as a CRM user much easier. They include OutlookForce which builds Salesforce into Outlook and works completely the same offline as online. All your records available anytime, without downloading in advance, without uploading the results, all reports, emails, and changes captured and synced whenever you reconnect. And it is built into Outlooks forms so it works exactly like Outlook. The same idea for documents; all stored on the desktop, all changes synced automatically and delivered the desktops of other users. There are several other applications with equally cool features, and they’re all designed for the end user, to make Salesforce.com work for you. We’re going to be running some live WebEx demonstrations over the next few weeks that are open to everyone and will show off the entire suite. Just go to: http://www.invisiblecrm.com/webex and register for a session. It seems that Microsoft Dynamics CRM 3 uses all of the various server components that we already have (e.g. SQL Server 2005, Small Business Server 2003, Exchange Server 2003). 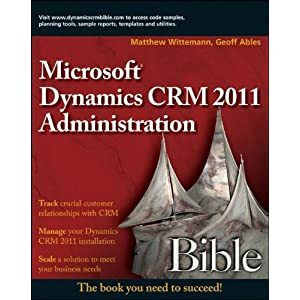 I'm checking out whether or not we can get away with just using Outlook with Contact Management, as opposed to Microsoft Dynamics CRM 3 (customization and scalability are important). We are a small insurance brokerage. Followup and in-house security are important. What distinguishes one from the other?